This food is superb! The most versatile of Kusuris foods, rapidly gaining a deserved reputation for amazingly low waste production. 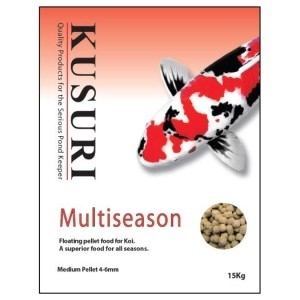 Kusuri have formulated Multiseason specifically for Northern Hemisphere temperatures so it can be fed conveniently as a pellet food, without any residue on pond water. Containing Kusuri Klay, Propolis, ”Optimum” food enhancer and pre-biotics, Multiseason is a very special recipe acknowledged as having the ultimate ingredients for feeding to produce excellent growth and colour improvements in koi. You will discover that feeding little and often will produce very low levels of fish waste. Multiseason can be mixed with any of the other foods in the Kusuri range. Basic analysis: Protein 38%, Oil 8.5%, Fibre 2%, Ash 9%, Moisture 8%. Smaller quantities of this food can be purchased as Elite All season.